Third degree burns over most of his body. Those of us, who lived through it, remember. It was a trauma and a great loss. Our lives changed that day. The crash occured at 25,000 feet between an F-89 fighter jet and a new DC-7 airliner undergoing a final test flight. 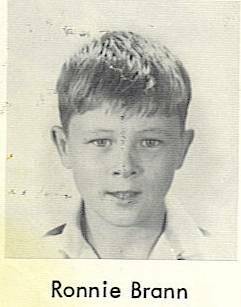 The year was, January 31, 1957 . 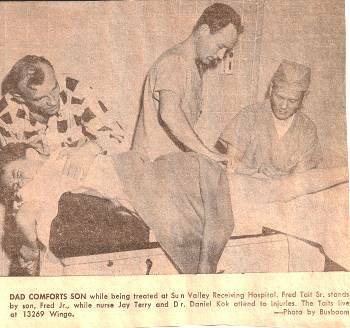 Outrage over the deaths led to construction of a hospital in Pacoima and a ban on military operations over the Valley. 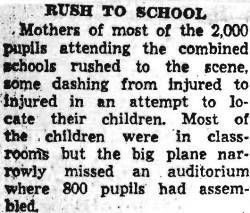 No memorial was ever built on the school grounds to remember the students . Thanks are given to Leon Atkins, for providing the newspaper articles. 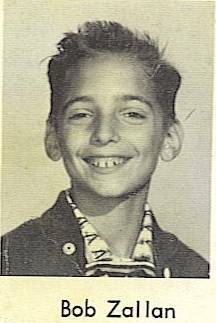 Thanks also to Nabor Jaramillo for the class pictures and sharing the story of his classmates. Midair collision. On the last functional test flight of the brand-new airliner before it was to be delivered to Continental Airlines, a crew of four was aboard the four-engine Douglas DC-7B aircraft (N8210H) as it departed Santa Monica Municipal Airport. 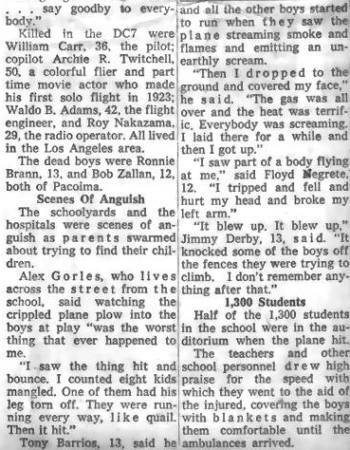 Co-pilot for the Douglas Aircraft Co. test flight was veteran flier Archie R. Twitchell, 50, who enjoyed a secondary career as an actor between flying stints and appeared in over 70 films, including “I Wanted Wings,” “Among the Living,” “Out of the Past” and “Sunset Boulevard,” among many others. 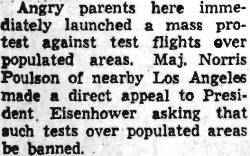 That same morning, in Palmdale, a U.S. Air Force Northrop F-89J Scorpion jet fighter (52-1870) took off on a similar test flight, one that involved a check of its on-board radar equipment. Both aircraft were performing their individual tests at an altitude of 25,000 feet in clear skies over the San Fernando Valley when a high-speed, near-head-on midair collision occurred. 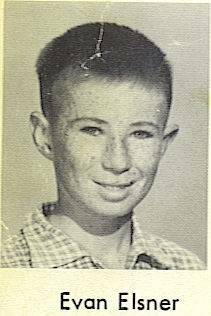 The radarman aboard the twin-engine F-89J Scorpion, Curtis Adams, was able to safely bail out of the stricken fighter jet but its pilot, Roland Owen, died when the aircraft plummeted in flames into La Tuna Canyon in the Verdugo Mountains. 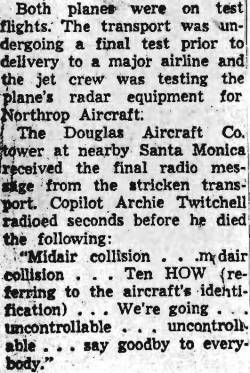 The last reported message from the fatally crippled DC-7B airliner was from co-pilot Archie Twitchell, who radioed, “Mid-air collision! Mid-air collision! Ten-How (the plane’s radio designation) . . . We’re going . . . uncontrollable . . . uncontrollable . 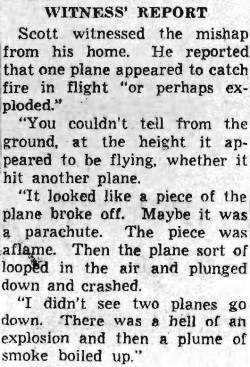 . . Say good-by to everybody.” With a portion of its left wing sheared off and while raining parts and debris onto the neighborhoods below, the DC-7B entered a sweeping turn and began a high-velocity dive earthward. 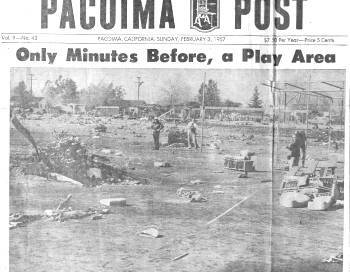 It disintegrated at about 500 to 1,000 feet above the ground and slammed into a Pacoima churchyard, killing all four crew members on board. 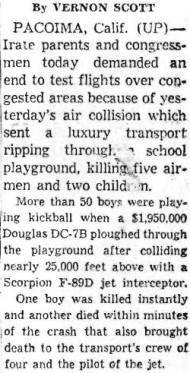 Upon impact, portions of the DC-7B exploded into hundreds of flaming pieces that slashed across the adjacent playground of Pacoima Junior High School, where some 220 boys were just ending their outdoor athletics activities. 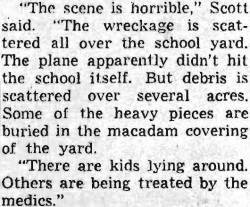 Ronnie Brann, 13, and Robert Zallan, 12, were struck and killed by the flying blast of wreckage and debris from the crashing airliner. A third gravely injured student, Evan Elsner, 12, died two days later. 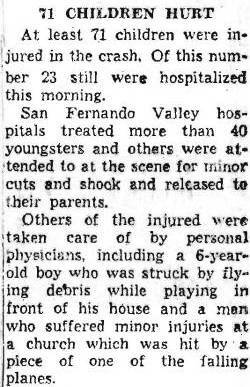 An estimated 74 additional students on the playground suffered injuries ranging from minor to critical. A second F-89 Scorpion jet, being used as a radar “target” by the first one during the equipment tests, was not involved in the collision and its two-man crew did not witness the accident. The collision was blamed on pilot error: Failure of both aircraft crews to exercise proper “see and avoid” procedures regarding other aircraft. 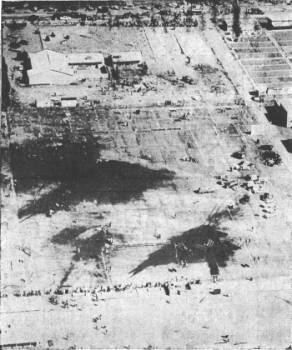 The catastrophe prompted the Civil Aeronautics Board (CAB) to set restrictions on all aircraft test flights, both military and civilian, requiring that they be made over open water or specifically approved sparsely populated areas. 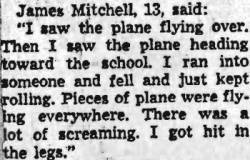 Fatalities: 8 -- 1 of 2 occupants of the F-89J Scorpion jet; all 4 crew members aboard the DC-7B airliner; and 3 junior high school students on the ground. 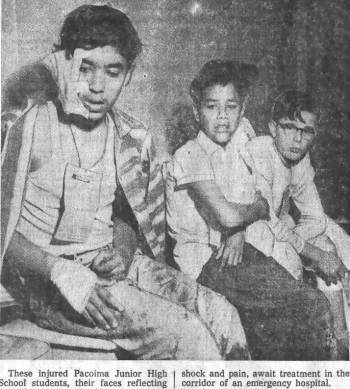 Anthony Barrios,his face bandaged, in the middle Floyd Negrete, and Orlando Salazar. Fracture of the neck, jaw and left shoulder, concussion and second degree burns. Head injuries, a piece of metal hit him in the head by his ear. Suffered 2nd degree burns to his hands and had a steel rod inserted into his right leg. A piece of the plane, hit his leg. Sustained burns and broken ribs. 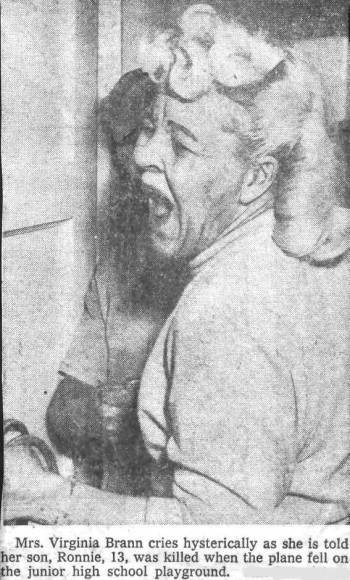 Thank you, Bob Funkhouser for contributing this newspaper clipping.